I had originally fitted a pair of factory SUs to this car on the original claw foot manifolds. They weren't all that bad. Power was fine after I fitted new needles. The original needles just didn't seem to taper, and didn't let in nearly as much fuel as my 3.9 demanded. Fuel consumption increased from 30mpg to 25mpg with the new needles, but the car was more than 5mpg more fun. 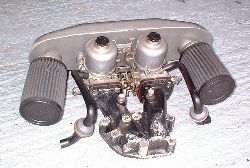 The major problem with the original installation was the manifold. Some of the cylinders ran rich, and others lean. The camshaft and heads were in excellent condition so I'm certain the manifolding was the problem. This caused pinking on the lean cylinders and made the car very sensitive to timing. I used to run on about 4 degrees advance. On the plus side, the SU carburetors are a really nice design, and with the new needles I couldn't fault the tractability. I'm convinced that a pair of SUs on the original Rover manifold would be an excellent set up for the MGB V8, although I'm not sure how they could be fitted under the bonnet. The Weber 500 carburettor came with my new engine. I'm not sure I'd have bought one otherwise. It's a pretty impressive carb to look at - with 4 chokes. Mine site on top of an Edelbrock Performer manifold. It's a big carburetor. No way does my car need all 500cfm. But the way the Weber operates is quite cunning. Normal running is on two ckokes. It's only on more than two thirds throttle that the other pair of chokes open up. Full throttle performance is excellent, but initially I had a poor idle and poor low speed running. Part throttle was quickly solved with a pair of slightly richer metering rods, but the driveability still isn't perfect just off idle. All the plugs are the same colour, and I don't get a hint of pinking at 8 degrees static advance. 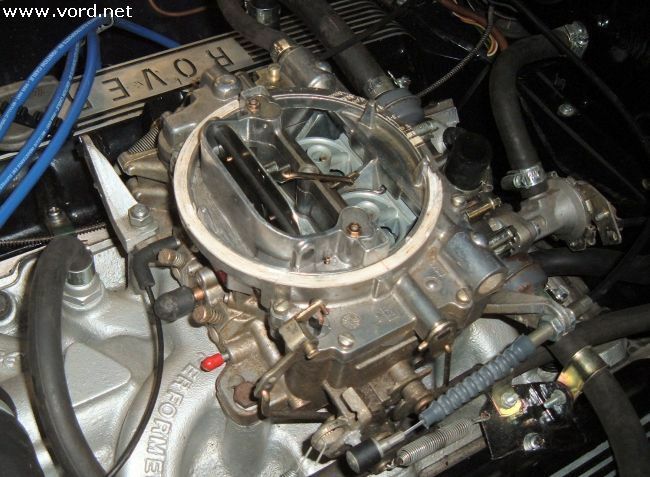 The car has noticeably more power with the Weber 500 carburetor, but then it also has a Piper 270 camshaft these days. It's difficult to say how much is down to the camshaft and how much down to the carb. Fuel consumption with the Edelbrock carburetor is still around 25mph on a long run. Hot starting and hot idle are both poor. The car doesn't seem to idle on all 8 cylinders when hot. Hot starting involves churning the engine over on full throttle, the car eventualy bursting into life. That, and the smell of petrol inside the car, are a sign of fuel evaporation from the float chambers. The carburetor is not thermally isolated from the engine, so maybe I can improve things by fitting an insulating block.